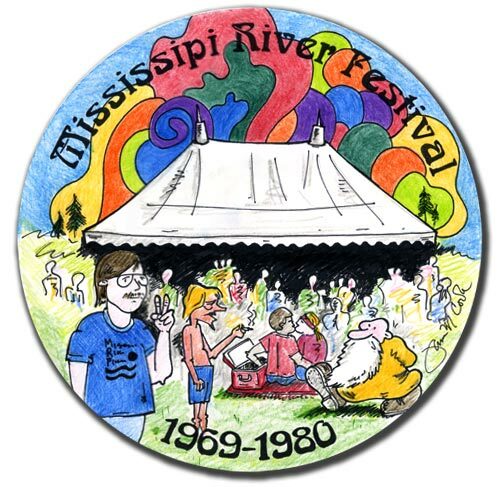 For over a decade the Mississippi River Festival (MRF) on the grounds of Southern Illinois University Edwardsville was host to great music and a variety of characters. Occasionally I was one of them. Just wanted to let you now that I love this plate! I, too, was one of the “characters” at MRF. My first concert was Iron Butterfly in 1968(?). I was on the verge of 14 and remember watching the “hippies” smoking something and when they left, the shook their blanket and a pack of Wheat Straw paper landed on my leg. I had no idea what these were. I took them home and they sat on my dresser for a few years until I put them to good use. Can I buy a plate? Wow! What a great place. Saw my very first concert there. Had to be ’70-’71, the James Gang & Black Oak Arkansas. Saw many great bands there for only $3.00. Sat in the seats once for $6 or $7 to see the Henry Paul Band & Molly Hatchet. Was lucky enough to attend the ZZ Top show that ended the MRF in ’80. Lot of memories there. The road to backstage is still there off Poag Rd. when passing by occasionally, I still think about some of the good times I had there in my teens-early 20’s. Are you aware of SIUE’s MRF Picnic on June 13, 2009? I’m in the midst of designing the poster for the event and would like permission to use the image from this plate. Do you know who I would locate for permission? You can contact me. I’ll send you an email. Next Next post: Rat Fishkin?